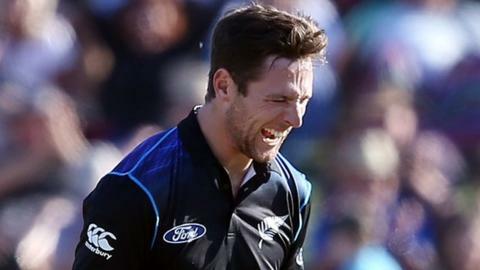 Worcestershire have signed New Zealand fast bowler Matt Henry for the first half of the 2016 season. Henry, 24, will fill in as the county's main overseas player from early April until the end of June. South African Kyle Abbott will then take over in early July for the second half of the season. "Worcestershire have had strong links with New Zealand cricket going back to when Glenn Turner played for them for many seasons," said Henry. "And, more recently, with Colin Munro and Mitchell McClenaghan too. "I hope I can play my part in getting them off to a good start in trying to regain that Division One spot - as well as having another successful run in the T20 Blast." Henry was on last year's New Zealand tour to England, taking 4-93 and 2-106 on his Test debut at Lord's in May, and two further wickets in the second Test at Headingley. He claimed took two more wickets in his third and most recent Test appearance in November against Australia at Perth. Christchurch-born Henry made his first appearance at Worcester last May, when he took 2-71 and 3-58 for the New Zealand tourists in their 15-run win over the hosts. He has also played in 20 one-day internationals, helping the Kiwis to reach the 2015 World Cup final, before going on to take 13 wickets in the recent 3-1 series victory over Sri Lanka.